In the 1970s, tucked between the sounds of Jethro Tull, Pink Floyd and a host of rock bands, Jonathan Edwards was a voice of folk-country-pop clarity. His pulsating rhythm guitar, riveting harmonica playing and crisp and tender vocals, was an escape for a country post-Vietnam, and he offered a dose of originality and simplicity few have brought to the airwaves since. Edwards, who plays the Rose Garden Coffeehouse in Mansfield, Mass., on Saturday, has not rested on the laurels of his 1971, self-titled gold-record debut. Sure, the songs from that LP remain in high demand, songs like “Sunshine,” the pot-loving “Shanty” or the tender “Sometimes.” He has since been a part of more than 20 projects, from CDs to DVDs, and thankfully, has continued writing. The singer-songwriter now lives in Maine, but the Minnesota-born Edwards has traveled the country (and out of country) and at 67, he still prefers performing in front of a live audience. He says he’s always anxious to get in front of the crowd and perform. In the 60s, Edwards went electric when Dylan did, and he joined bands and toured. The grind got to him, though, and he felt he wasn’t enjoying his music anymore. He went off on his own, touring the college circuit. That’s where I first saw him, while attending UConn in the late 70s [Full disclosure: I work as Edwards’ webmaster.]. This initiative not only got him gigs, it also got him before bigger audiences, as he eventually opened for BB King and the Allman Brothers, and it landed him his first recording contract. After years and years of performing, he became an “overnight” success. “Sunshine,” which got its start on a Boston radio station, was an expression of independence and defiance and its message rang true with young people. 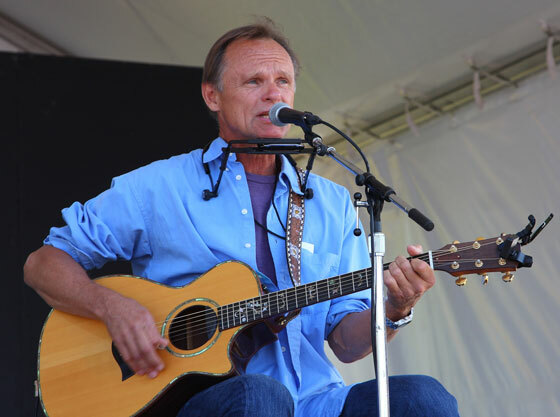 Since then, Edwards has grown, performing as the leader of other bands, and even joining with the legendary Seldom Scene for a time, and he has experimented with numerous sounds. 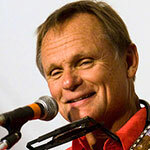 His newest songs, pieces like the idealogical a cappella “This Island Earth,” the tender “One Day Closer,” his dedication to John Denver in “Johnny Blue Horizon,” or the recent song of country devotion, “My Love Will Keep,” show that Edwards remains a vibrant songwriting force. Joining him on Saturday night will be keyboard player Tom Snow, who has adderd another dimension to Edwards’ music. On stage, Edwards often tells of meeting his daughter for the first time and revels in the art of the sing-along. And with Edwards’ songs, singing along just seems about the right thing to do, even for young people new to his music. He just has a way of connecting, and sheds his shoes when performing. The Rose Garden show is the finale of the venue’s 25th season, and it will feature the coffeehouse’s annual performing songwriter competition. Performing two songs each for a $100 prize and a gig next season are Lara Herscovitch of Durham, Conn., Zoe Mulford of Swarthmore, Penn. and Mike Laureanno of Providence, R.I. Although Edwards has never performed at the Rose Garden, he says it says a lot when a venue lasts for 25 years. The Rose Garden Coffeehouse is held at the Congregational Church, 17 West St., Mansfield, across from the South Common. Doors open at 7:30 p.m. For more information, visit the Rose Garden website.